By LaGayle ~ June 18th, 2012. Halibut is the Wine Peeps fish of choice. We especially enjoy it blackened or broiled with Cajun seasonings. An excellent seasoning to use is Chef Paul Prudhommeâ€™s Blackened Redfish Magic. This dish is delicious, easy, and quick to prepare. 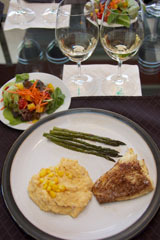 Along with the flavorful fish, this challenging wine pairing meal included a mixed green salad, roasted asparagus with balsamic browned butter, and creamy polenta. As usual, I consulted the book, What to Drink with What You Eat by Andrew Dornenburg and Karen Page, to determine which wines to pair with this spicy dish. 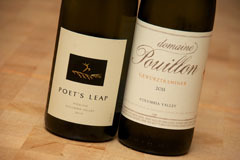 I selected the 2010 Poetâ€™s Leap Riesling and the 2011 Domaine Pouillon Gewurztraminer. Both wines were excellent; however, the unanimous choice as the best pairing with the meal was the Riesling. The slight residual sugar and crisp acidity of the Riesling works really well with the fatty acids in the fish and the spicy Cajun seasonings. 2011 Domaine Pouillon Gewurztraminer (Columbia Valley, Washington): Pale, greenish straw yellow. Very aromatic with lychee nut, Anjou pear, and spice on the nose. Juicy pear and spice come through on the palate. Dry to very slightly off-dry and medium-bodied with crisp acidity. Well-balanced with a very long, refreshing finish.